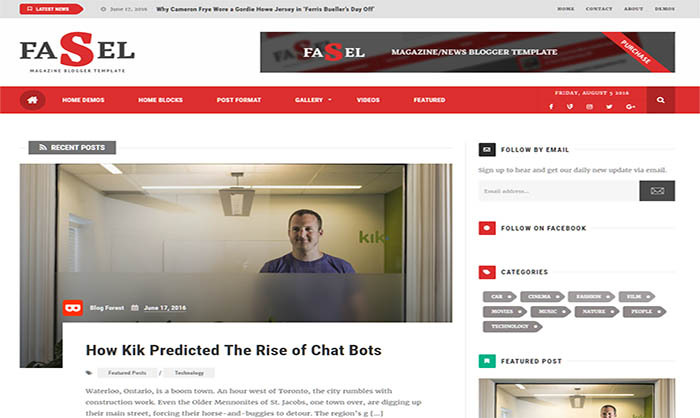 Fasel Blogger Template is a responsive theme that’s specially designed for Magazine, News and Technology based websites and blogs. If you’re looking to give your Blogger site a whole new look, touch and feel then Fasel Blogger Template is a perfect choice. It was built to support wide-rage of blog niches like fashion, lifestyle, travel, decoration, technology, multimedia, and personal blogs. It has a very clean and minimal design and follows latest design standards. It has full responsive design that help you get visitors from different devices around the world. Just like our previous released Viral blogger template, this theme has full support for responsive design and works perfectly on all devices including desktop, smartphones, laptops and tablets.